Solid macro slider from FotoMate, not much else to say, it's solid and it works. This one is built solid, about 4mm thick material, with strong rubber on top and a nice surface. On the top plate it has two male 1/4" attachment screws and a female 3/8" in the middle which has an inlay that converts it to a 1/4". Under the main plate it has a 1/4" attachment hole for tripods and such. 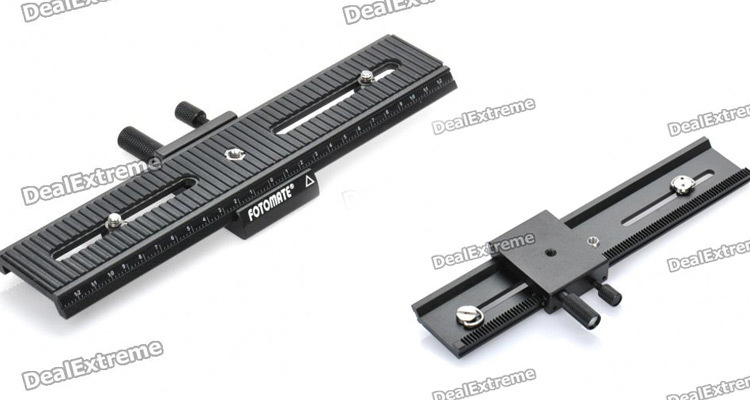 Adjustment is done with a solid screw which has a good grip and feel to it and it locks with another screw that can also be use to give the slider some traction. Maybe not a con, but if you need some really fine tuning be aware that a full turn on the adjustment screw moves the slider about 2cm.